Our suit featured in a Brides.com photo shoot! From time to time we have the great fortune of collaborating on photo-shoots with some other really cool local businesses. We thank The White Dress by the Shore in Clinton for inviting us to participate in this photo shoot featured on Brides.com! 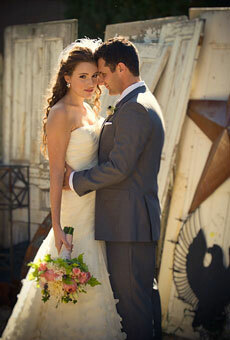 Enjoy these pictures and check out the suit we provided for this vintage garden style wedding party. It was a gray, wool, two button, notch lapel suit by Sartoria Tosi. I like the cut of the Tosi suits. They are slim without being too trendy and they look great on just about everybody who puts one on. I liked it so much I had to get one for myself! Here's a pic taken of my wife and I during our engagement photo shoot. Not too shabby... I have a feeling that in twenty years (and thirty pounds from now) I'll be looking back and remarking on how thin I was!